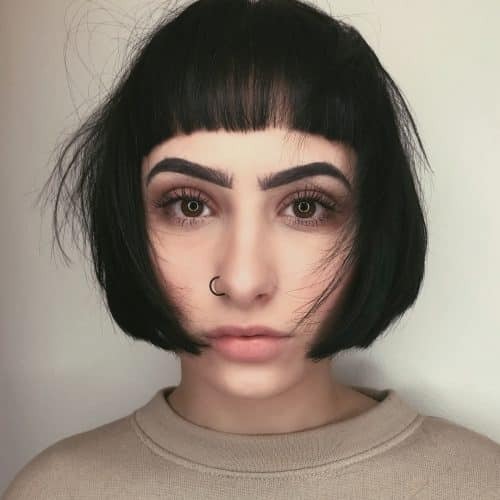 Today we are going to talk about haircuts for long face shapes and see photos of the most amazing hairstyles that work best for this face shape. The perfect hairstyle on the wrong face shape can ruin a girl’s day (or next few weeks) faster than a bad date. In the excitement of getting your hair done, it’s easy to get swept away by all of the options. One detail we should never forget is face shape! Although the “ideal” face shape is oval, you should be happy you have a long face shape! The goal for longer, more oblong face shapes is to make them appear wider. Minimizing volume on top of your head and avoiding too much length and vertical lines by sticking to horizontal lines will add width. If you have a big forehead, bangs cover up the extra length and can really flatter women with thicker hair as well. Lastly, you’ll want to avoid cuts and styles that add height to your hair, since they’ll elongate your entire head length. Create a look that not only works for your face shape, but also your style, taste, hair type, etc. Mix and match everything you’ve learned and be inspired by these photos of the best hairstyles for women with a more oblong face shape. This look is a modern messy take on the classic square bob with blunt bangs. The greatest thing about it is the twist of a classic shape with a messier finish that makes it lived in, trendier, and more today! This haircut and style are suitable for just about anyone! It is especially good for someone with a longer, more narrow face shape. The line of the bangs and the line from the length of the bob shortens the length of the face. It would also be ideal for someone with more fine hair because it will make it look thicker. I would recommend Aveda thickening tonic and Aveda Smooth Infusion glossing straightener to get more volume and have a sleek finish but with a messy texture! This was cut dry based on her natural curl pattern. It’s a long bob with a subtle angle and slight graduation. I love how the curls fall into the shape easily, and the weight is properly distributed to accent the style. 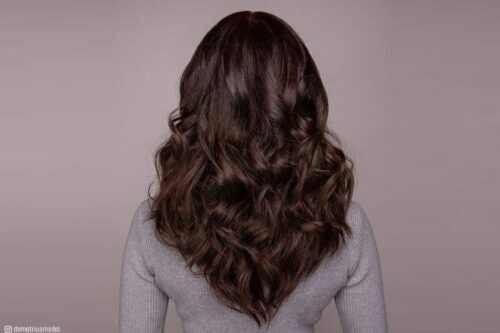 This look is good for someone with naturally curly hair or someone with straight hair who wants a style that easily falls into place without too much styling and is structured and defined. This haircut is a soft, curly shag. Some of the things I like about it is that I cut the hair while dry, using The Hive Salons Curly Method of cutting. This method took Colleen’s curl pattern and texture as the guide for creating the shape no matter what products she styles her hair with. Her curls have been cut in the natural fall/texture so that they will perform consistently. As far as the overall look, this type of haircut really opens and frames the wearers face and offer a lot of versatility when styling. If Colleen pulls her hair back, her eyes and cheekbones will still be framed beautifully by the fringe. When styling, I used a curl moisturizing cream called Quiet Calm Curl Control from Innersense Organic Beauty to offer lightweight hydration. Moisture helps curls spring up. Then I applied a volume glaze called I Create Volume to help set the curls. This is a haircut that can truly be tailored to anyone’s face shape! The main components of a good shag are curtain fringe, lean length, and volume at the crown. You can base the length of your fringe by whether you want to partially cover your forehead or accentuate the area between the eye and the cheekbone. Then, you can add volume in the crown via layers and take them as short or as disconnected as you like. This then removes some of the weight in the midsection of your hair but preserves the density at the ends. Then, based on what you and your stylist determine, you can choose to layer out the rest of the shape for more of a vintage vibe. Anyone who wants to wear this look should invest in a diffuser attachment so that they can add volume and texture to their hair. Air drying can minimize the volume. I love using volume foams and gels for the blowdry, and sea salt spray to finish. This gives the hair more grit and volume without making it overly frizzy! 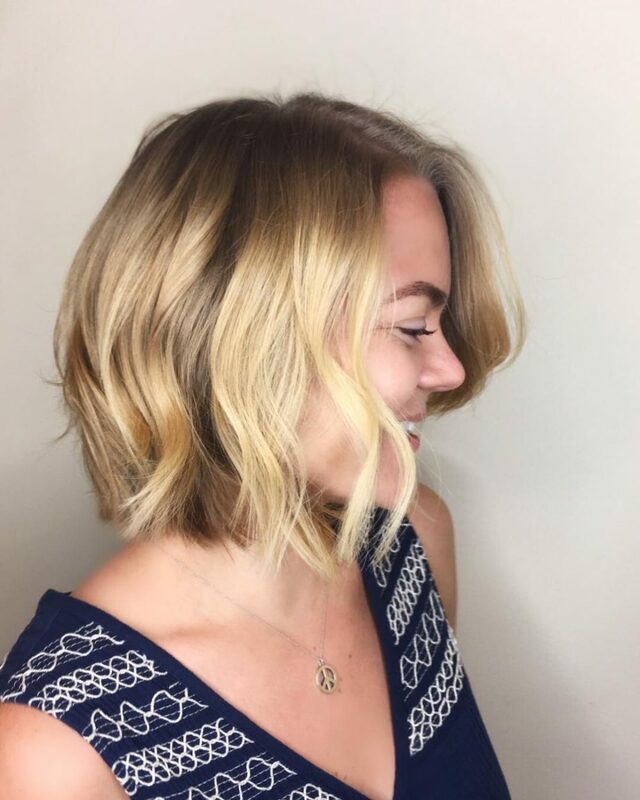 It’s a blunt long bob (lob) with lots of texture. It has no top layer but has tons of interior shattered layers. I like that it can be worn sleek, or when curled, it has tons of layers and texture and looks more sassy and fun. This cut can be worn by everyone, but be specific with your verbiage for your stylist. Also, you can add a stack to it. It’s not a heavy stack, so if that’s what you are going for then you need to know the back will be more layered. Air drying or tousled drying will help with giving extra volume and texture. Curl with a hot tool 1-inch iron or 1.25-inch iron. Let the curls cool then spray with a texture spray like Kevin Murphy Bedroom Hair. Then comb out with a wet brush, tousle, and it’s perfect! I’d describe this look as 60s/70s boho chic. The long fringe is probably my favorite thing about this look, along with the relaxed beach waves. Keep your hair texture in mind. The fringe is the focal point of this cut, so you want to make sure it’s properly groomed and styled. If your hair is frizzy/curly, know that in the mornings you’ll probably have to spend a few minutes extra styling it. If you do not like having hair in your face, I recommend keeping the fringe (or curtain bangs) on the longer side. This look is for someone who wants an effortless style and hair color. The short textured bangs work beautifully for long and oblong faces. The longer layers make it easy to style or wear with its natural texture. Overall, this haircut is very universal. 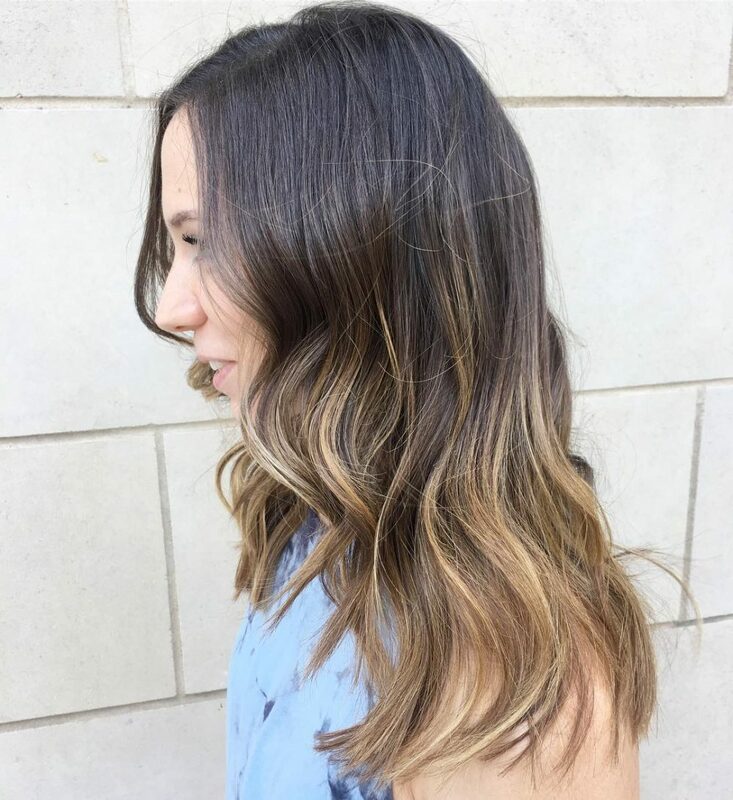 My favorite thing about this look is how natural and low maintenance the balayage color and haircut is! You should definitely consider a bang if you want to draw attention to your eyes or have a long face shape. 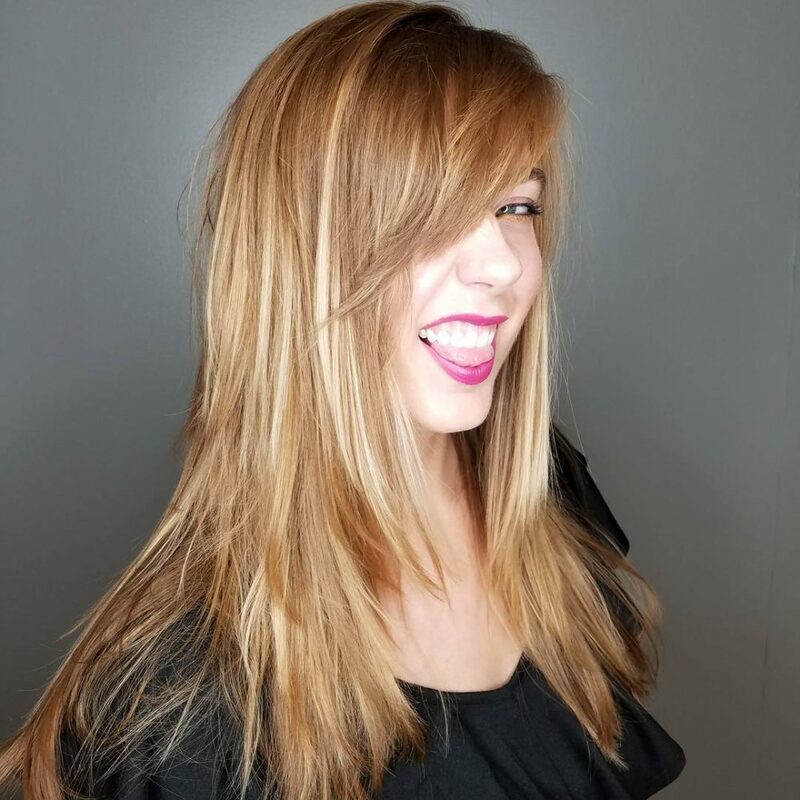 Bangs are a big change that will be easy to transition. The long layers make it easy to style and go well with any type of hair. Daily styling of bangs may or may not be needed depending on your hairline and hair texture, so make sure to take that into consideration if you’ve never had bangs before! This is also a good color choice for someone who has never colored their hair before. 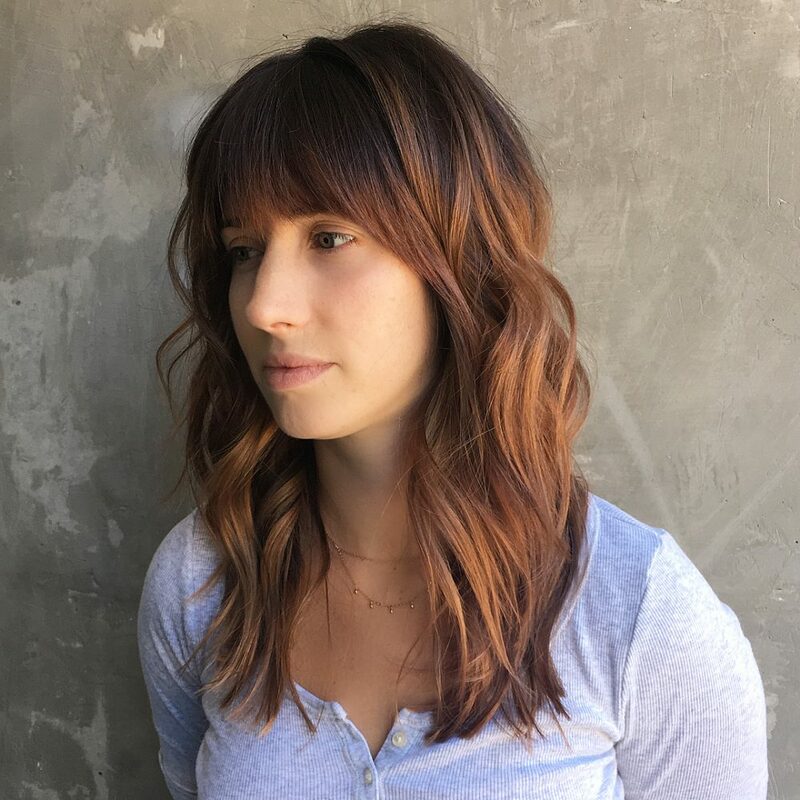 This is a haircut with light graduation and soft layers created with razor texture and side-swept bangs. It’s a fresh and modern look that is practical to recreate by styling on a daily basis. What I like the most about this cut is the practicality. Short haircuts like this are easy and a modern look to style. It’s a perfect cut for women with strong personalities. 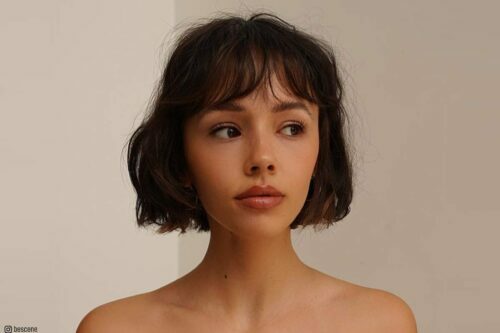 Someone with a long face shape can wear this cut and style due to the disconnected tips that give softness and lightness to the face. We used Revlon Equave on the hair before drying. After the hair was dry, the hair was styled with a Babyliss iron and a mattifying powder called Dust It Flex by Osis. This is a long layered cut with a textured fringe. My favorite thing about this look is the bangs. We wanted to change up the look without losing any length. 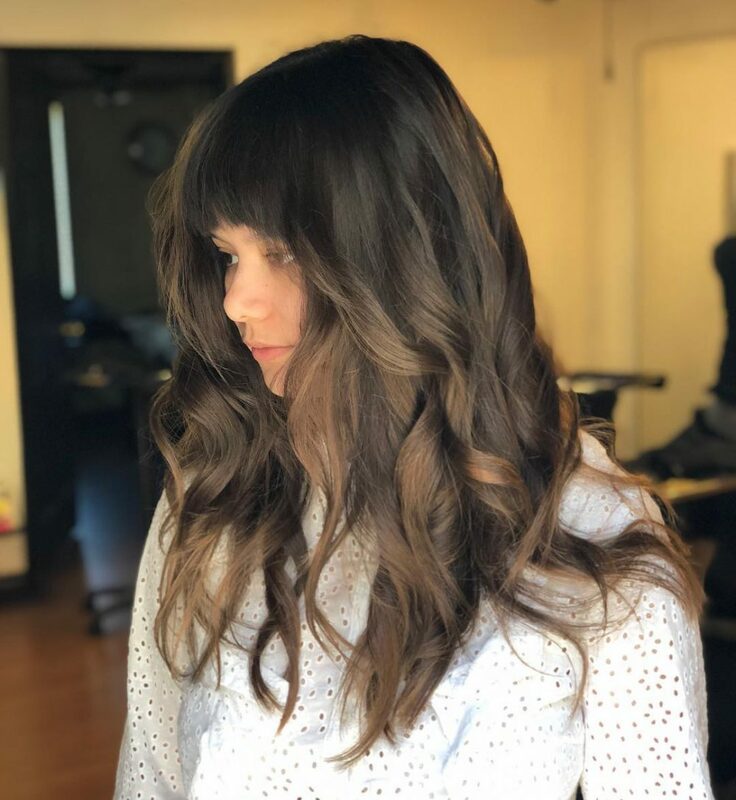 She wanted to cut a “curtain bang”, but we decided on a full textured bang with the option to let it grow into a curtain bang so that she can get several weeks out of the fringe without needing a touchup. My advice would be to really consider the commitment you want to make when cutting a fringe or bang. They can be a great way to change the entire look of a haircut without making major changes to the length. I always ask my guests if they just want to go on a date, or jump in and get married…to the bangs, of course! That always helps me gauge how committed they are willing to be to a new look, or if they just want a temporary change and nothing they have to maintain. Once you know the “dating status” they are comfortable with, you can discuss the options of what kind of a fringe will work for your guest. 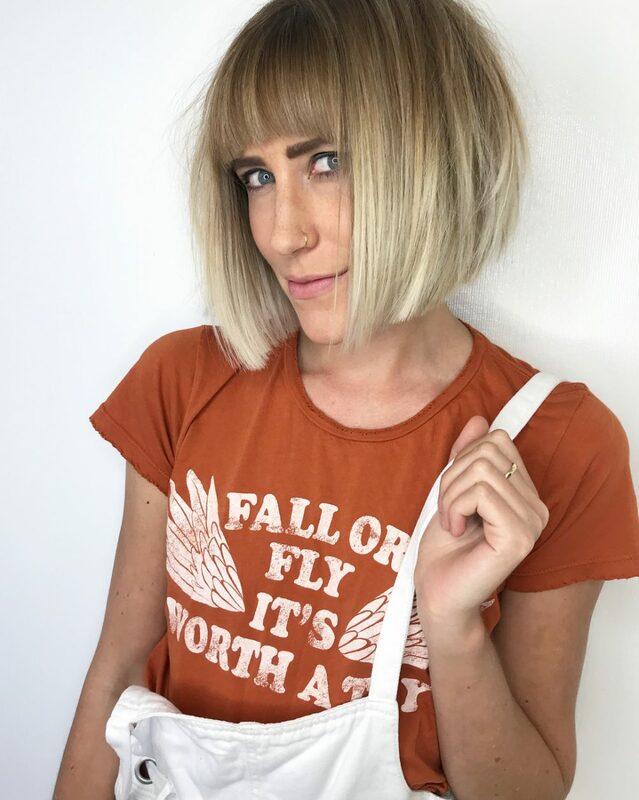 You want to keep them from hating you for talking them into a drastic change when really they just needed a soft, side-wept fringe to feel like their long hair got a new update. A thorough consultation is very important when making this decision. I also like to recommend a statement fringe for my guests that wear their hair up a lot as it gives a completely different look to your average ponytail. 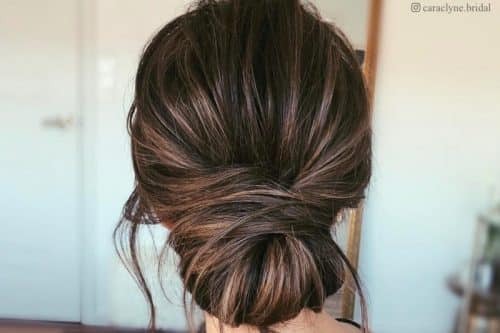 If a guest has never worn a bang before, I will ALWAYS pull the hair forward to see if there are any cowlicks that will affect the way the hair will fall. I will check with the hair both wet and dry before making any decisions. 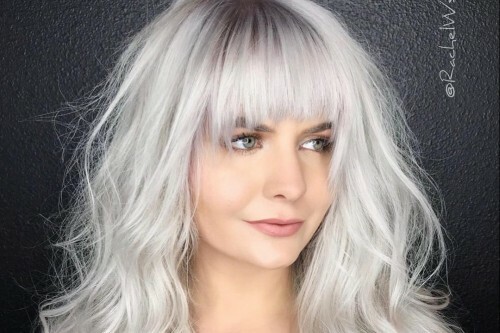 You want to be very clear to your guest that bangs require a lot more maintenance and that their hair and face shape may not be ideal for this look. 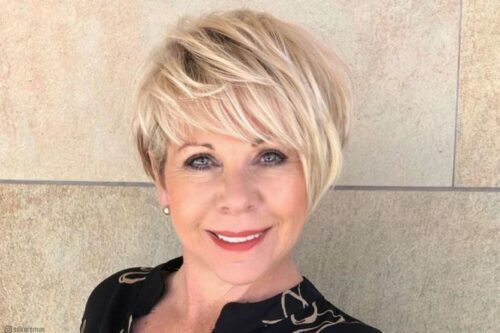 Any guest with a narrow forehead should be very careful about wearing too heavy of a fringe as it can have the tendency to really close in their face. A guest with a taller forehead is going to love the way the bangs give great balance to their long face shape and bring a lot of attention their eyes. The product I recommend most is dry shampoo! 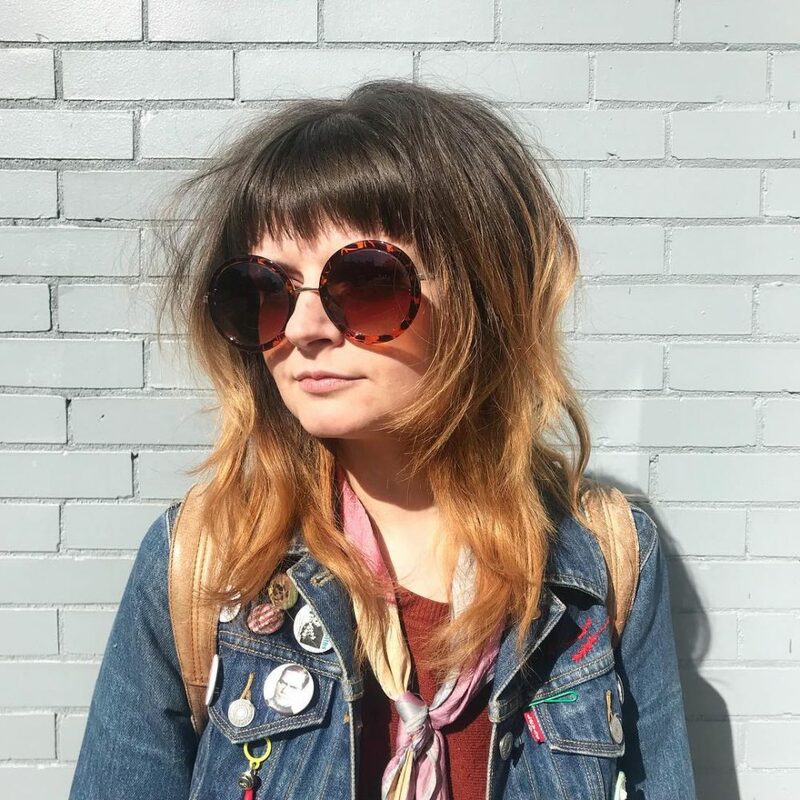 A good dry shampoo can really make you love your bangs or fringe all day long. The oils from your forehead can make a great fringe look heavy and greasy. I tell my guests to spray them immediately after styling them to keep the oils from working their way in, then refresh throughout the day as needed. I would describe this look as a very textured and effortless look. My favorite thing about this look is that it allows the client to be very versatile when styling their hair. Products to recreate this look include two of my favorites. I recommend Oribe’s Dry Texturizing Spray before adding hot tools, as well as some R+Co Rockaway sea salt spray to finish it off for extra volume and hold. I recommend this look to any client with thicker medium to long hair that wants a super lived-in look with lots of texture and movement. It is an ideal look for anyone with a long face shape. This look is a modern take on a classic 70s shag, using Stevie Nicks as an inspiration. I love the versatility of this cut and how it gives long hair movement. I use Aveda products. For this look, in particular, I used Smooth Infusion Style Prep, Styling Creme and Dry Remedy Oil to finish the ends. If you want a more wavy, or beachy look, I would use Brilliant Damage Control, Texture Tonic and finish with a light spray of Air Control hairspray. You control the amount of layering in the interior and face frame to complement a long face shape. This look has bangs, but it looks great without bangs too. It does work best on below the shoulder to above the waist hair that is medium to thick. On fine hair, I would just do the face frame. In regard to styling, you can blow it out straight, scrunch it in beachy waves, or even wand it for a more polished look. All of these styling options fit an active lifestyle. I would describe this look as a fall-inspired modern day shag. 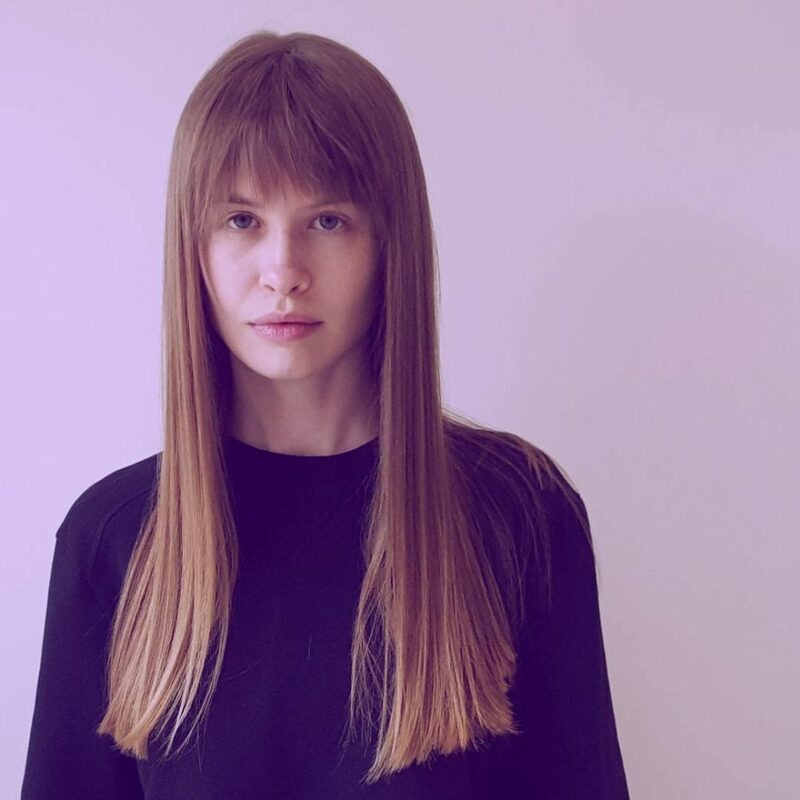 The look has long rounded bangs which connect into the haircut. 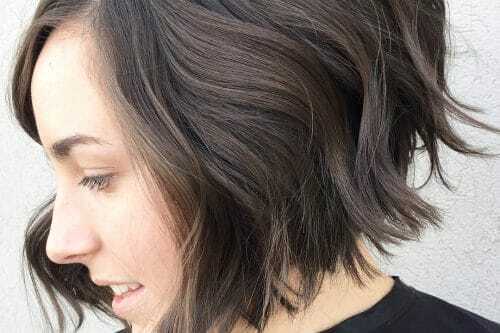 Her layers are shorter in the front to give her a more textured/shaggy look, however, they still connect to the rest of her haircut to create fluidity throughout. Her color was inspired by a “fall leaf”. We wanted to portray the warm tones of fall, yet keep it natural and low maintenance. My favorite thing about this look has to be the face-framing bangs because they frame her face so well and suit her personality. I also love her color. I balayaged her hair a few times last year and I love that the color deposited so dimensional. It really completes the look. I recommend using a volumizing spray such as R+Co’s Dallas all over before blow drying. The bangs should be blow-dried smooth with a brush, but the rest of the hair can be roughly dried to enhance the textured look. Next, take a 1 1/4-inch curling iron and curl big sections in opposite directions. Be sure to leave the ends out to create more of a natural looking wave. Spray a texture spray like Oribe’s Dry Texturizing Spray throughout the hair, then finger comb to brush out the curls and disperse the product. 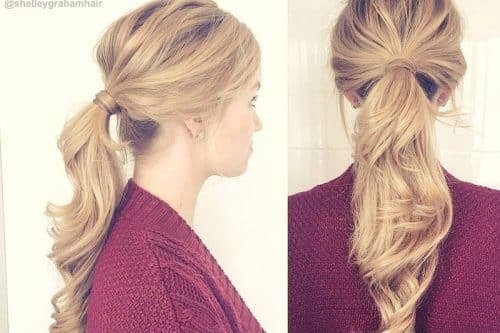 This hairstyle is very versatile and would be great for anyone with straight or wavy hair. You must be willing to style your bangs every day with a blow dryer, but the rest of the style is low maintenance. The choppy layers are short and fun, but the long enough to pull back into a ponytail or bun. 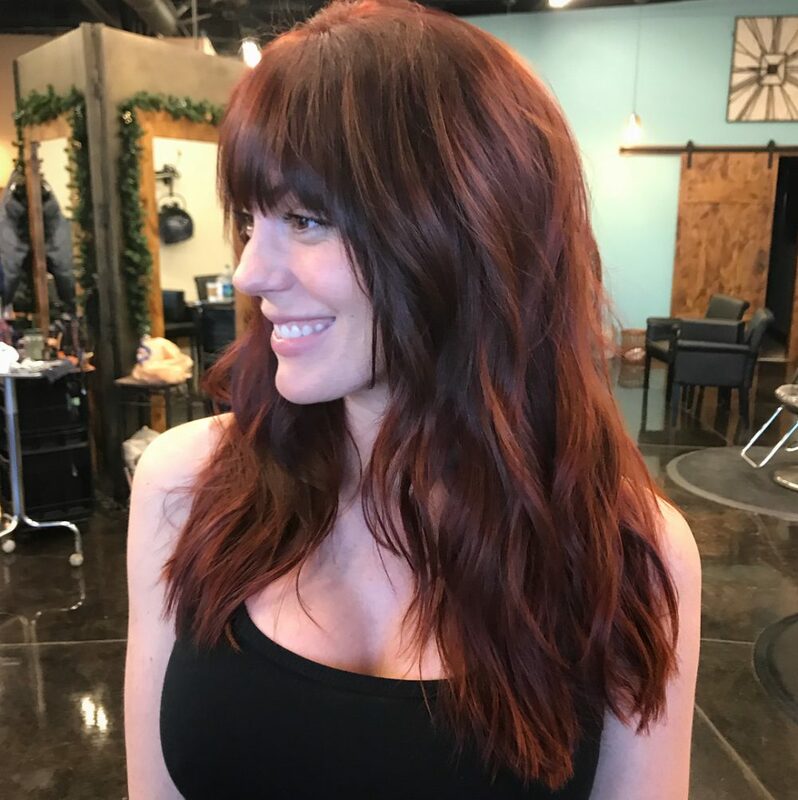 This color is great for most people too because it is rich yet natural, allowing the client to have fun with their color without going too extreme. I love this haircut and would consider this a shag cut. My favorite thing about it is that it is a haircut that it can be modified for many hair types and face shapes. It easily translates as an effortless look, and I love that this haircut isn’t super high maintenance. The products I recommend using to recreate this look are by Davines. I love to use This is a Texturizing Dust on the scalp to boost the roots and This is a Dry Texturizing Spray to add some grit to the hair. I love the texturizing spray because even if I am a little heavy handed with the spray, it doesn’t weigh the hair down too much creates a lived-in look for your client. To maintain this look, I would recommend frequent bangs trims because they will be the thing that needs the most maintenance. Other than that, it’s easy to have fun with this look. I recommend modifying the cut to your client’s needs. 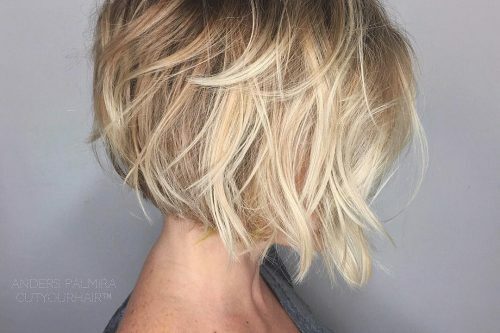 I like to cut hair in its natural state for these kinds of cuts because I want the style to be easily recreated by my client. 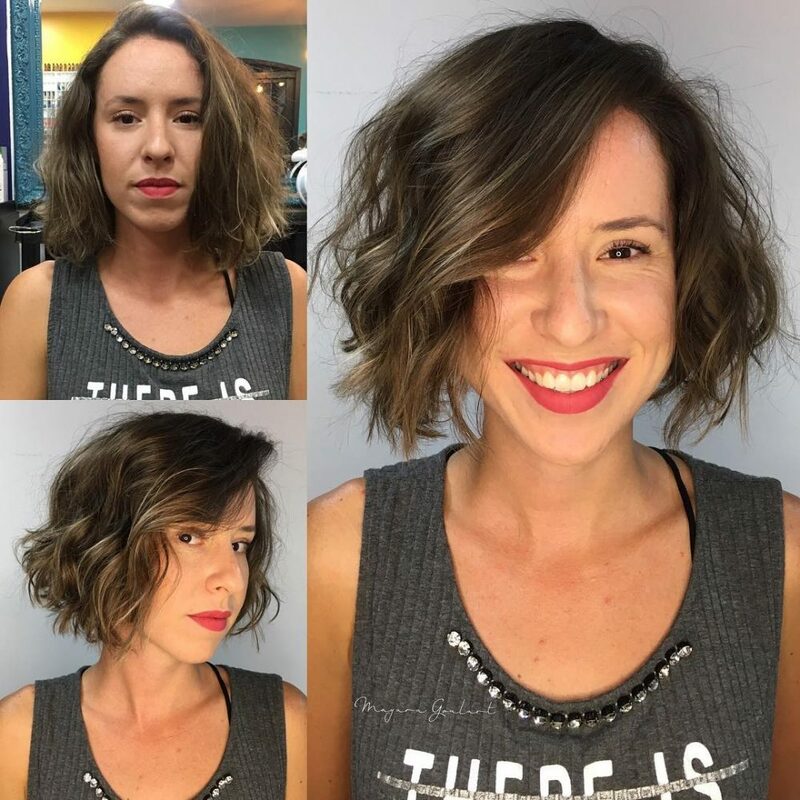 I’ve had lots of fun with my curly girls and my ladies with straighter locks with this cut, but I like to take the shape of their face into consideration and I determine how severe I frame their faces depending on that. I would describe this look as an edgy textured pixie for short hair and I absolutely love the all the texture in the fringe. I used a razor for about 90% of the haircut and I just love how it gave this hair extra life. To maintain this look, I highly recommend a pomade. Using a pomade lets you spike up the hair a bit and you can piece out the fringe for that messy yet sleek look. I used Johnny B Xtra Hold pomade. 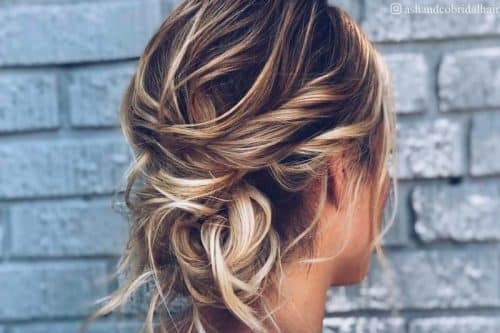 This hair would be perfect for someone that is willing to style their hair daily but doesn’t want to spend lots of time on it. While the hair is wet, simply add some pomade to create the texture you want and you’re done. 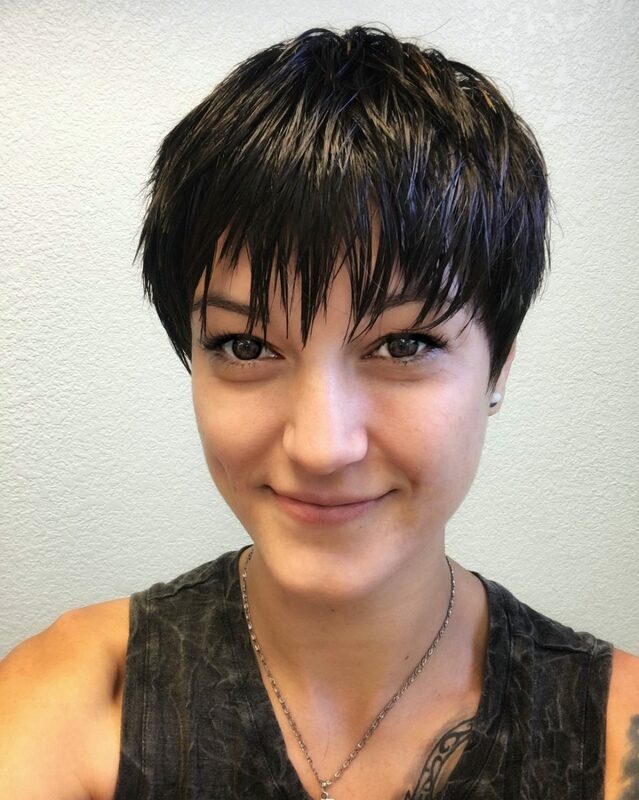 This particular pixie was done on a client with fairly thick hair, so we were able to create a ton of texture with it. I believe this is the best haircut for an edgy client with a long face that wants a look that’s easy to style. This look showcases the hair cutting technique I use for creating a straight contour line on shoulder length hair. I have personalized the look with a short texturized bang. It’s my favorite detail! 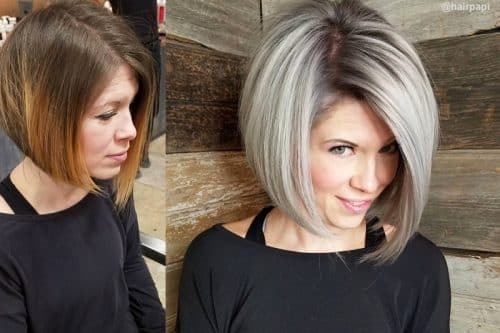 This haircut is suitable for girls with healthy and thick hair. It doesn’t really matter if the hair is thin or dense, the main thing is that it must be straight. I would describe this look as a blonde textured blunt bob. 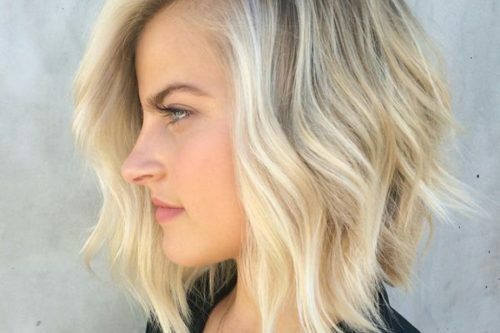 My favorite thing about this specific look is the mixture of movement and texture, as well as the blunt lines that can make the hair appear fuller. It is such a fun haircut! For bob hairstyles like this one, I love a good textured hairspray of dry shampoo, a powder-based spray. Bedroom.Hair by Kevin Murphy is my personal favorite. These types of sprays can help add volume and show off the texture and shape of the cut. Clients with finer textured hair are great candidates for this cut because it helps to make the hair look much fuller. It is also great for ladies with pin straight hair and that need lower maintenance but still want a styled look. 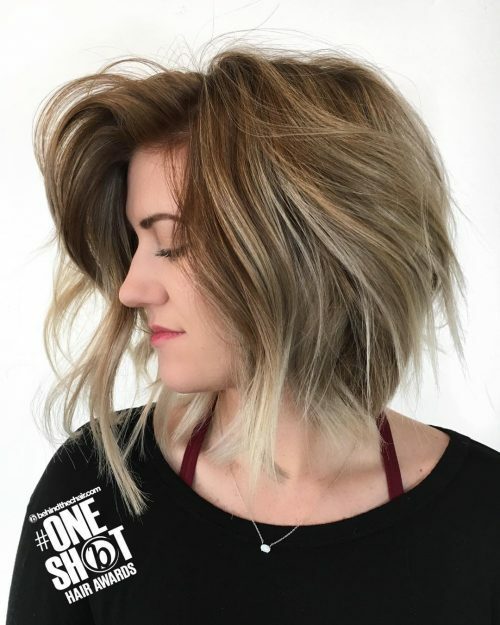 This look is a chin length bob with soft layers. It has wispy ends and a long side-swept bang/fringe. I️ love this look on my client because it is feminine and flirty. It is fun and the minimal layers give it soft movement, especially when waved. My product recommendations for this look and texture would be Kerastase Lincroyable Blowdry Creme and Materialiste for thickening. You can air dry, round brush, flat wrap or curl. I️ used a 1 1/4-inch barrel curling iron. To add texture, volume and long wear, I️ recommend my favorite Oribe Dry Texturizing Spray. This look is for fine hair or minimal textured hair on a round or square shape face. The cut for the woman who likes the effortless look. She styles her hair for events and weekend dates and can still pull it back for workouts and errands. Own your inner deity with this majestic look. If you are bored with your long hair, this will get you out of your rut. The only thing you may need to practice to master this look would be your braiding skills. All bow down, her highness has arrived! Apply shine serum to your hands and run them through the hair, shaping the curls as desired. Select a thick piece from behind the ear and weave strands into a fishtail braid. Secure the end with a small elastic. Wrap the braid across your forehead and pin the end of the braid under the hair. UNITE’s Luxury UOil is a lightweight oil that gives the hair weightless shine and softness for all hair types. Curly and thicker hair types will experience more texture with this type of style. Ash brown highlights create a softer look for any face shape. The more effortless and bigger the waves are, the fresher you look. Waves are a hot trend everywhere. This a great style for hair with little to no layering. You can get away with only restyling the top if you want to stretch your wash days. Trendy, easy and haute for a long face! Apply styling foam to damp hair. Blow dry hair away from face with a medium round brush. Dry a side part into the hair. Use a curling wand or iron to curl just the ends away from the face. Brush through curls with fingers, reshaping them into waves. Vita Volume is a great lightweight volumizing foam by Keratin Complex that gives weightless volume. This look will give finer hair types more natural volume. This style is for those of us who love a great curl look and have a more oblong face. With so much texture and movement going on in the hair, longer facial features can get lost in all the hair action. With this much volume and texture, a center part helps to keep balance for the overall look. This a great look to try the center part trend if you haven’t already! Spritz dry hair with a heat protectant and comb throughout. Section hair into sections about the size of the base of your iron rod. Spray each section with a working styling spray and comb through. Wrap sections of hair around a medium curling iron or wand. Wrap the curl into a pin curl and pin it to the head to cool. Repeat this curling process throughout the entire head. Spray hair with working spray and allow it to settle on all the pin curls. One by one, unpin the curls and let them fall. Comb through hair with fingers, reshaping your curls into perfect ringlets. Use a shine gloss to define the curls if desired. Glotion Potion by Keratin Complex creates softness and shine, even in coarse hair textures, and uses shine-enhancing silicones to smooth the cuticle and add weightless moisture and gloss. This look works well on longer face shapes. Naturally curly or wavy hair will hold this look best.